Yesterday was the annual "Venti Miglia" trip around the Trondheim fjord. Kenneth from the local Alfa Romeo owners club organized the event and about a dozen or so cars took part this year. 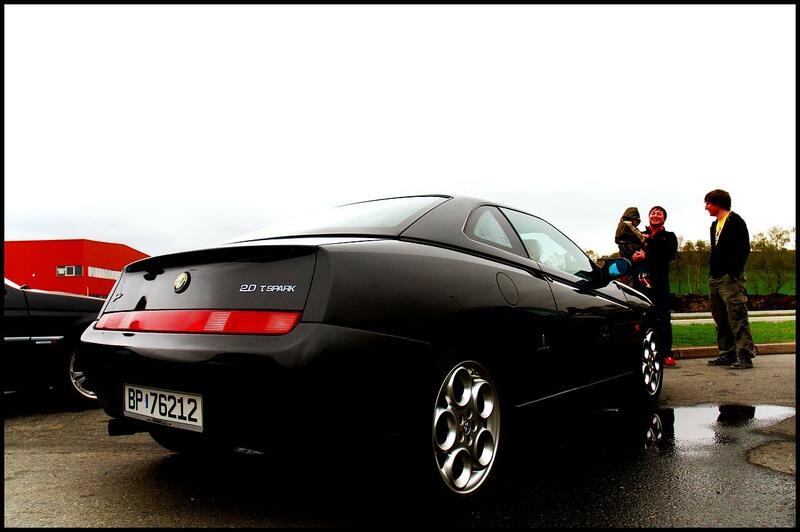 The weather wasn't the best this year, but that really didn't matter that much since hanging out with the Alfa crowd and having fun driving is the main theme. It was also a chance to put the new tyres I got late last year to the test. I have to say that I was a bit impressed. The roads were narrow, bumpy and wet but there was still amazing amounts of grip. Kudos to Pirelli for PZero Nero; you've made some really good tyres. I would have thought that they would slip a lot more in the wet, but they stayed planted. After driving Ståle's 147 a bit the last few days the suspension on my 156 feels a bit wishy-washy (and my 156 isn' exactly what you'd think of as "soft"). Ståle's 147 has a really nice, stiff setup done by Knut Engdal. There's absolutely no body-roll. None. And for a rodent (front wheel drive) it has sharp turn-in without being nervous in a straight line. Of course, this comes at a price. It'll eat through suspension parts and your passengers will inhale sharply and hold their breath whenever they see a bump in the road ahead, but if you like to feel connected to the car it is a real fun car to drive. Oh, and the recent upgrade to Brembo Max grooved brake discs: lovely. It adds another dimension to braking. If you wear thin-soled driving shoes you can feel the grooves on the brake discs through your foot. Absolute braking bliss.